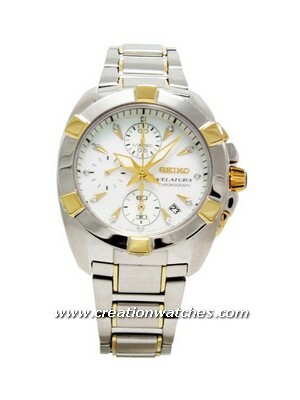 Seiko Arctura watches have been the distinguish design for Seiko’s Kinetic technology. The new Kinetic Chronographs combine the very best of traditional watch-making with the most advanced Kinetic technology. The Seiko Arctura collection depicts sleek design and along with kinetic technology delivers unbelievable precision performance. No longer just Kinetic watches, the Arctura collection now comprises of Chronographs as well as Kinetic Chronographs, Kinetics and ladies Kinetics. The new Seiko Arctura Kinetic Perpetual is a masterpiece of understated intelligence. Its dial design is sleek exterior, calm and refined which combine to create a watch of restrained elegance. The length of service of Kinetic is confederate to a perpetual calendar correct to February 28, 2100 to create a watch that is as low maintenance as any on earth. It incorporates the wonderful Kinetic Auto Relay function. This function allows the watch to go into sleep mode after 24 hours of inaction. While the watch is in sleep mode, it’s hands stops, but this watch remembers the time for four years, and the hands re-set automatically to the exact time as soon as the watch is put on again. The dial of this watch is unique. The time of day dial clearly separated from the chronograph minute hand for easy use. The case and dial design reflect exactly the flowing nature of Arctura. This chronograph requires no battery change ever and has 5 months autonomy on full charge. This Chronograph will time to 1/5th of a second, for up to 45 minutes, with snap-to-zero mechanism. The metal of this watch is stainless steel & the movement is kinetic. Caliber no is 7L22. Its crystal type is sapphire. It is Japan made. Its bracelet is integrated solid steel. The dial color of this watch is white and there is Hour, minute and second hands. It also features automatic power generator, Stopwatch minute and 1/5 second hand. Stopwatch measures up to 45 minutes in 1/5 second increments. Kinetic Watches are Seiko’s latest and most technically advanced watches, which contain their own internal electrical generators–operated by natural wrist movements–making them independent of conventional storage batteries. Duration of full charge is approximately 5 months. Approximate Case width including crown: 44mm. Newsletter: Seiko Military and Orient Bambino Automatic watches on sale!